Clementines are rare in Old Master paintings: far more exotic and unusual than other citrus fruit. Thus, in a Hans van Essen still life of a table weighted with luxurious items – lobsters, a silver ewer and platters, a silver-gilt cup, a crystal glass of wine, grapes, fine linen and porcelain bowls – there are only four clementines, rather than the abundant heaps of oranges and lemons of contemporary paintings. Only in the 20th century do they become common enough for artists to revel in the saturated colours and rougher skin of tangerines; artists such as Félix Vallotton and Tamara de Lempicka. 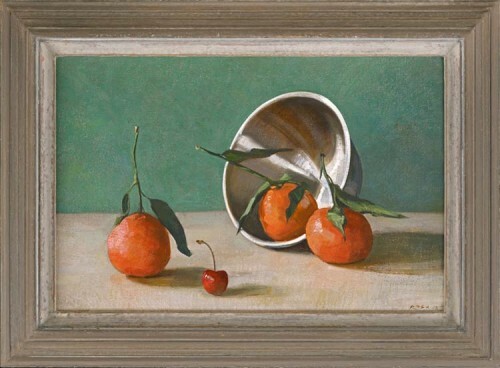 Stephen Rose, like de Lempicka, revels in the contrast of a rich cadmium orange with the bottle green elongated leaves, and like her contrasts the asymmetrical fruit with a smooth round bowl. The dull greenish aqua background of the Rose is his own, however: a shifting multiplicity of colours and tones, it conjures an illusion of unmeasurable, vibrating space, and providing a jewel-like complement to the fruit.